Our hilltop soils and cooling evening winds increase the sugar levels in our fruits. You will be amazed how good tree ripe apples are! Our trees are on a trellis system, making for easy picking and keeping fruit within reach. We currently offer Royal Gala, Jonagold, and Honeysrisp. 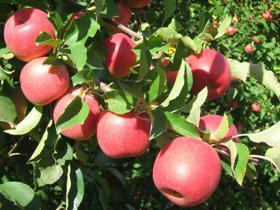 -Ripe apples will be partially to mostly red depending on variety. -Pick by using a twisting and pulling motion. Ripe fruit should pick easily and the stem should come with the apple, not pull out or break off part of the branch.